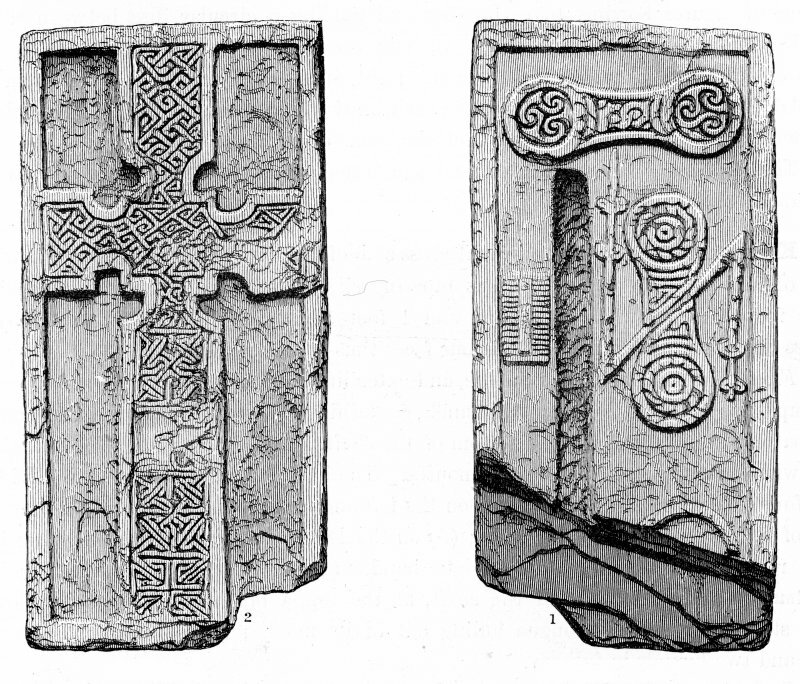 Digital image of cross-slab from Monifieth. Neish, 1873, pl.4. Evidence for discovery: discovered in the foundations of the medieval church when it was demolished in 1812, and built into the wall of the new church. It was given to NMAS in 1871. Present condition: areas of wear on face A and missing its basal portion. A compact cross-slab, this is carved in relief within a flat-band border on both broad faces. Face A bears a cross with squared arm-terminals and a square centre to the head, which is bordered by a plain moulding and filled with diagonal key pattern. The background to the cross is plain. 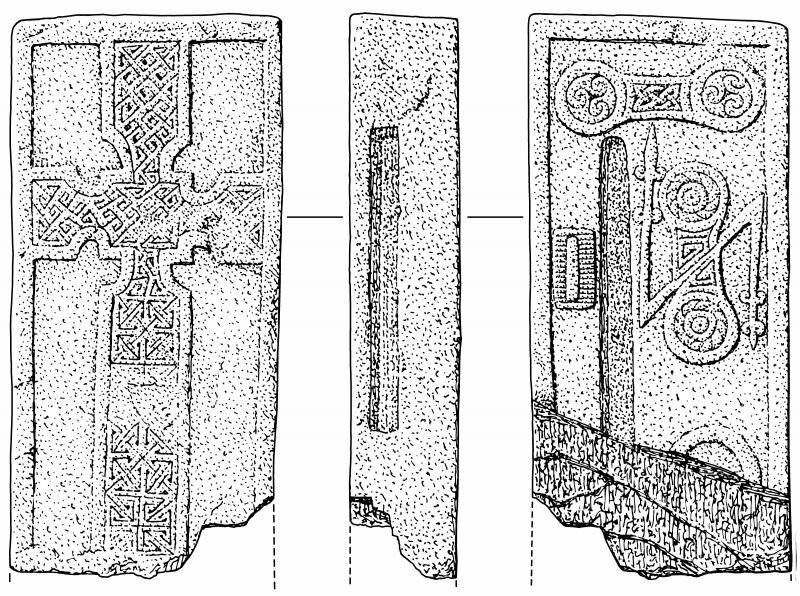 Face C bears three Pictish symbols and part of a fourth, apparently arranged to respect a substantial vertical groove. The symbols include a decorated double disc, a decorated double disc and Z-rod, a double-sided bone comb and an arc which is probably part of a mirror. Narrow face B also has a long vertical groove, which suggests that the slab was designed as a shrine corner-post (John Borland). Date range: eighth or ninth century. Primary references: Neish 1872, 73; ECMS pt 3, 228-9; Fraser 2008, no 66.1. No. 1 is an upright cross-slab measuring 0.72m x 0.36m x 0.15m. It bears a cross on the front face. The reverse is decorated with the comb and two double-disc symbols intersected with the Z-rod. In the RMS(NMAS) Acc.no. IB 26. Monifieth 1: Cross on face with on the reverse a double-disc above a comb and double-disc and Z-rod. Monifieth 2: On the reverse a female figure with crescent and V-rod and deer's head above.